Refusing to pay taxes for war is probably as old as the first taxes levied for warfare. Up until World War II, war tax resistance in the U.S. primarily manifested itself among members of the historic peace churches — Quakers, Mennonites, and Brethren — and usually only during times of war. There have been instances of people refusing to pay taxes for war in virtually every American war, but it was not until World War II and the establishment of a permanent, centralized U.S. military (symbolized by the building of the Pentagon) was the modern war tax resistance movement born. Most Quakers were opposed to taxes designated specifically for military purposes. Though the official position of the Society of Friends was against any payment of war taxes. Property was seized and auctioned, and many Quakers were jailed for their war tax resistance. A number of Quakers even refused the “mixed taxes.” Up to 500 Quakers were disowned for paying war taxes or joining the army. Following the war many Quakers continued to refuse because these taxes were being used to pay the war debt, and therefore were essentially war taxes. The Quakers reacted strongly to this war because of its aggressive nature and the threatened spread of slavery posed by the war. Many, again, refused to pay war taxes. However, the most famous instance of war tax resistance was that of Henry David Thoreau. Although not a pacifist he was opposed to slavery, and the imperialist and unjust nature of the war. His refusal to pay the Massachusetts poll tax levied for the war resulted in a night in jail. This whole experience was recorded in his essay, “On the Duty of Civil Disobedience,” which has had a profound influence on many people since. In 1942 Ernest Bromley refused payment of $7.09 for a “defense tax stamp” required for all cars, and thus became the first known war tax resister in the modern era. He was arrested and eventually jailed for 60 days. Though Bromley and a few other pacifists did not pay income taxes during World War II, but there was no movement of war tax refusal. In April of 1948 a conference on “More Disciplined and Revolutionary Pacifist Activity” was held in Chicago, attended by over 300 people. The Call to the Conference (signed by A.J. Muste, Dave Dellinger, Harrop Freeman, George Houser, Dwight Macdonald, Ernest Bromley, and Marion Bromley, among others) expressed a need for a more revolutionary pacifist program and action techniques. Out of this conference grew a new organization, calling itself the Peacemakers. Their newsletter was titled Peacemaker. About forty people who attended the conference stated their intention to refuse part or all of their federal income taxes, forming a Tax Refusal Committee. This Committee began almost immediately to publish news bulletins, independent of the Peacemaker. The bulletins were instrumental in engendering concern and giving information on tax refusal. War tax refusal succeeded in achieving nationwide publicity in 1949 with the issue of a Peacemaker press release titled “Forty-one Refuse to Pay Income Tax.” For almost twenty years Peacemakers was virtually the only consistent source of information and support for war tax resisters. The Catholic Worker, The Progressive, Fellowship, and a few other movement newsletters and magazines, would occasionally print sympathetic articles on war tax resistance. Following World War II and up to the start of the Vietnam War only six people were imprisoned for war tax resistance related issues: James Otsuka, Maurice McCrackin, Juanita Nelson, Eroseanna Robinson, Walter Gormly, and Arthur Evans. All had been found in contempt of court for refusing to cooperate in one way or another with the proceedings. War tax resistance gained nationwide publicity when Joan Baez announced in 1964 her refusal to pay 60 percent of her 1963 income taxes because of the war in Vietnam. In 1965 the Peacemakers formed the “No Tax for War in Vietnam Committee,” obtaining signers to the pledge “I am not going to pay taxes on 1964 income.” By 1967 about 500 people had signed the pledge. Then several events in the mid- to late-1960s occurred making this a pivotal period for the war resistance movement, signaling a shift in war tax resistance from a couple hundred to eventually tens of thousands of refusers. A suggestion in 1966 to form a mass movement around the refusal to pay the (at that time) 10 percent telephone tax was given an initial boost by Chicago tax resister Karl Meyer. This was followed by War Resisters League developing a national campaign in the late 1960s to encourage refusal to pay the telephone tax. In 1967, Gerald Walker of The New York Times Magazine began the organizing of Writers and Editors War Tax Protest. 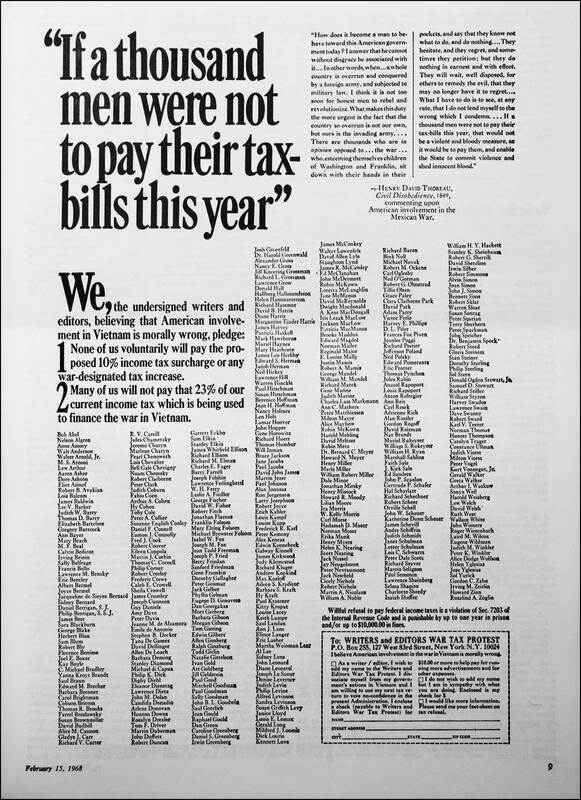 The 528 writers and editors (including Gloria Steinem and Kirkpatrick Sale) pledged themselves to refuse the 10 percent war surtax (which had just been added to income taxes) and possibly the 23 percent of their income tax allocated for the war. Most daily newspapers refused to sell space for the ad. Only the New York Post (at that time, a liberal newspaper), Ramparts (a popular left-wing anti-war magazine), and the New York Review of Books carried it. To see an image of the ad, click on link above. Ken Knudson, in a 1965 letter to the Peacemaker, suggested that inflating the W-4 form would stop withholding. Again, Karl Meyer was instrumental in promoting this idea, which was adopted by Peacemakers, Catholic Worker, and War Resisters League, among other organizations in the late 1960s. Inflating W-4 forms also brought a new wave of indictments and jailings by the government — 16 were indicted for claiming too many dependents; of those, six were actually jailed. The popularity of war tax resistance grew to such an extent that the WRL could no longer handle the volume of requests. So in 1969 a press conference was held in New York City to announce the founding of the National War Tax Resistance (WTR). Long-time peace activist Bradford Lyttle was the first coordinator. Local WTR chapters blossomed around the country, and by 1972 there were 192 such groups. WTR published a comprehensive handbook on tax resistance, Ain’t Gonna Pay for War No More (edited by Robert Calvert), and put out a monthly newsletter, Tax Talk. Radical members of the historic peace churches began to urge their constituencies to refuse war taxes. In 1972 Congressman Ronald Dellums (CA) introduced the World Peace Tax Fund Act in Congress, which was designed to create a conscientious objector status for taxpayers. The National Council for a World Peace Tax Fund was formed to promote this legislation (later changed to National Campaign for a Peace Tax Fund). The bill has been introduced into each Congress since. During the Indochina War, war tax resistance gained its greatest strength ever in the history of the United States, and on a secular basis rather than as a result of the historic peace churches, who played a very minor role this time. The government did its best to stop this increase in tax resistance, but was hamstrung by telephone tax resisters. There were so many resisters and so little tax owed per person that the IRS lost money every time they made a collection. The cost of bank levies, garnished wages, automobile and property seizures, and even the simplest IRS paperwork was simply too expensive to be worth it. National WTR folded in 1975 with the end of the Indochina War. By 1977 war tax resistance dropped to about 20,000 telephone tax resisters and a few thousand income tax resisters. Then in 1978 some radical members of the three historic peace churches got together to issue a “New Call to Peacemaking” that suggested war tax resistance as one way to oppose the arms race. The Center on Law and Pacifism was formed in 1978 to assist these and other war tax resistance efforts, issuing the book People Pay for Peace (by William Durland) in 1979. With the election of Ronald Reagan as President in 1980 and his call to rearm the U.S., many more people began to resist war taxes. The IRS admitted the number of war tax resisters tripled between 1978 and 1981. Like Joan Baez’s tax refusal announcement seventeen years before, a national stir was created in 1981 when Roman Catholic Archbishop Raymond Hunthausen of Seattle urged citizens to refuse to pay 50 percent of their income taxes to protest spending on nuclear weapons. Letters of endorsement of his stand were made by other religious leaders in Seattle and elsewhere around the country. In 1982 the War Resisters League published the first edition of The Guide to War Tax Resistance, which sought to provide a broad and comprehensive source of information incorporating the out-of-print Ain’t Gonna Pay for War No More, Peacemakers’ Handbook on the Nonpayment of War Taxes, as well as new material not included in either book. A fifth edition of the book came out in 2003. About the same time, WRL began producing its annual “tax piechart” street flyer, which analyzed the spending of the Federal government while promoting protests to military spending. This renewed interest in war tax resistance, spurred on by the unprecedented increase in military spending during peacetime, stimulated an escalated response by the government. Though there have been only three criminal prosecutions of war tax resisters since 1980, the IRS shifted tactics and began seizing property. In 1984 and 1985 after almost ten years of very few seizures, about a half dozen automobiles and a similar number of houses were seized from war tax resisters. Furthermore, in 1982 the government came up with a new civil penalty which was specifically aimed at war tax resisters. Called the “frivolous” fine, it charged a $500 penalty against anyone who altered their 1040 forms (e.g., by claiming a war tax deduction). In an effort to coordinate the growing interest in war tax resistance, a National Action Conference was called by WRL and the Center on Law and Pacifism in 1982. Out of this conference the National War Tax Resistance Coordinating Committee (NWTRCC) was formed. Every spring NWTRCC has issued press releases announcing Tax Day actions around the country. In addition to a bimonthly newsletter with the latest war tax resistance news, NWTRCC has issued several brochures, produced a slide show, and published the War Tax Manual for Counselors and Lawyers. Also in 1989, the IRS seized and auctioned the Colrain, MA, home of war tax resisters Randy Kehler and Betsy Corner; shortly thereafter, the home of resisters Bob Bady and Pat Morse, neighbors of Kehler-Corner, was also seized and auctioned. Within hours, a support committee was formed. Significant articles appeared in newspapers across the country. After their eviction in 1991, the house was occupied by a rotating collection of affinity groups until 1992, when the new owners forced their way in. A continuous vigil outside lasted until the fall of 1993. Throughout this entire period, considerable publicity, actions, and support were generated bringing a lot of attention to war tax resistance, U.S. military spending, and the misplaced priorities of the government. Four years later “An Act of Conscience,” a 90-minute film about the struggle, was finished. Meanwhile, from 1990 to 1993 the Alternative Revenue Service (ARS) was developed by the WRL and co-sponsored by NWTRCC and the Conscience and Military Tax Campaign. 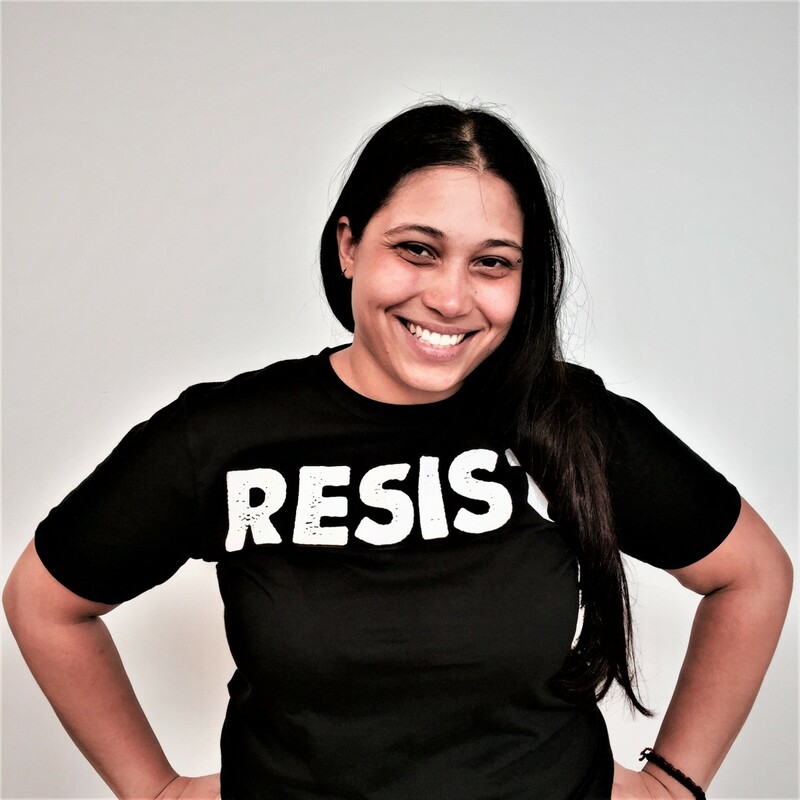 It grew out of a desire, shared by many war tax resisters, to have a nationally organized campaign that would reach out to new communities in a creative way, suggesting that even a token level of tax resistance is a valuable protest. During the 1990-1991 tax season, 70,000 EZ Peace forms – a parody of the IRS’s 1040EZ form – were circulated. About 500 forms were returned and over $105,000 in resisted taxes were redirected to alternative funds and other groups. By 1993, a decline in interest, made that the last season for the ARS. War tax resisters acted in coalition with millions of others around the world to stop the invasion of Iraq and have continued to campaign against war spending ever since. In 2003 one of the largest public acts of war tax resistance and redirection occurred when environmental activist Julia Butterfly Hill announced her refusal to pay $100,000 in federal income taxes from a legal settlement because of the Iraq war. The Iraq Pledge of Resistance initiated an internet-based telephone tax resistance campaign, Hang Up On War, that was endorsed by a coalition of groups. Resisters developed an alternative tax form — a “Peace Tax Return” — to simplify resistance. In July 2007 the Associated Press (AP) ran an article, “Fed Up With War, Some Won’t Pay Taxes” by John Christoffersen that brought significant attention to war tax resistance. The group Code Pink launched an online tax resistance pledge called “Don’t Buy Bush’s War,” and National War Tax Resistance Coordinating Committee started the War Tax Boycott campaign and collected pledges of over $400,000 of redirected tax money to donate to organizations helping victims of war. About six war tax resisters were jailed between 2006 and 2010 (but none to date since then), and the IRS continues to pressure individuals to pay or seizes money from bank accounts and salaries. With the ongoing wars and the increased militarism in the U.S., the peace movement and war tax resistance should have grown, but during the Obama presidency peace activism slipped into the background. In 2010 the National War Tax Resistance Coordinating Committee produced a half-hour video, Death and Taxes, about war tax resistance, which featured interviews with 28 people explaining why they resist. In late 2016, facing the incoming administration of Donald Trump, activism for justice and peace is on the increase again, and war tax resistance is getting a new look from many people. For more information on the history of war tax resistance, see the War Resisters League’s War Tax Resistance: A Guide to Withholding Your Support from the Military.